The following is NATO’s allied command operations directive on comprehensive operations planning. Though unclassified, NATO doctrine and policy documents are not released to the public. 1-2. NATO’S Contribution to a Comprehensive Approach. a. NATO recognises that that the military alone cannot resolve a crisis or conflict. There is a need for more deliberate and inclusive planning and action through established crisis management procedures that allow for both military and non-military resources and efforts to be marshalled with a greater unity of purpose. Adopting such a comprehensive approach to operations begins with inculcating a culture of active collaboration and transparency among those involved in crisis management. b. The initiation of such an operation should lie in: the development of a shared understanding of overarching goals to resolve the crisis; facilitating the production of a broad multi-dimensional response on how to achieve the necessary objectives to reach the international “end state”; the delineation of lines of functional activities, where possible, and the responsibilities for them; identifying the effects to be achieved; and agreement in the leadership function for the overall international effort. For the Alliance, this includes the development of process and structures for effective co-ordination and cooperation with other actors, to allow each to complement and mutually reinforce the others’ efforts, ideally within an overall strategy agreed by the international community and legitimate local authorities. c. Planning in a multi-dimensional environment generates particular challenges for both civilian and military actors. Experience shows that not only may there be no formally appointed lead agency to provide overall coordination, but that those organisations capable of reacting quickly are very often military in nature. In addition, some institutions may not wish to have formalised relationships with others. Thus, a comprehensive approach emerges through the determination of various actors to play their part to resolve a crisis. Pragmatism is often the way forward, as imperfect as this may be in an otherwise rules-based society. In this regard, unless otherwise authorised, it is not for NATO to offer itself as the lead coordinator. It is, however, right for all levels to look for opportunities for interaction and to collaborate actively under principles of mutual respect, trust, transparency and understanding, and a duty to share. Moreover it is incumbent on NATO, especially in the planning and early execution stages of an operation, to understand and to attempt to anticipate the needs and objectives of other potential contributors thus enabling subsequent coordination and cooperation. a. 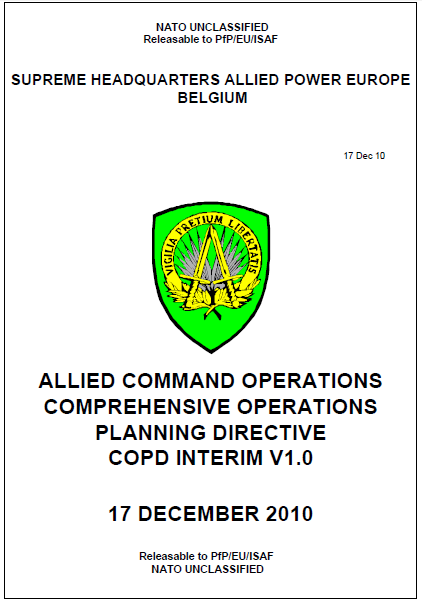 Set within the context of a NATO contribution to a comprehensive approach, the purpose of this Allied Command Operations (ACO) Comprehensive Operations Planning Directive (COPD) is to outline the military procedures and responsibilities governing the preparation, approval, assessment, implementation and review of operations plans to enable a common approach to operations planning. This includes the associated documents which are required in order to execute the mission allocated to SACEUR and his subordinate joint force commanders. b. The COPD provides a common framework for collaborative operations planning when defining NATO’s Contribution within a comprehensive approach philosophy. It is deliberately detailed, to support training, while giving experienced planners, at the strategic (Chapter 3) and operational (Chapter 4) levels, the necessary tools to fully appreciate all elements of the most complex crisis and produce high quality operations plans. It also covers details for the preparation, approval, promulgation, distribution, implementation, review and administration of operations plans documents necessary to execute the tasks allocated to SACEUR and his subordinate commanders. Its processes attempt to cover all expected scenarios; however, as planners become more familiar with the concepts of the COPD, it should be used to guide rather than slavishly followed. c. Design, planning and execution are human matters where commanders lead and staff support. Intuition, experience and military judgement remain paramount and this directive provides the processes and tools to support commanders’ decision making at the strategic and operational levels. But the COPD is not an end in itself, merely a tool. Commander’s guidance at every level provides staff with the vision of how a challenge is to be tackled and provides subordinates with the freedom to operate within the broader context of the mission. For collaborative planning to work effectively, it is vital that planners, at each level, not only have a common understanding of the crisis situation and a common approach to developing the necessary plans to support NATO involvement, but also understand how the commander and staff operate at the next higher level so they are able to contribute to and influence the process. d. Crises are dynamic and the planning process is iterative, influenced and crafted by the factors described earlier. Throughout the planning and execution process, there must be a continual review process to update the design, plan and execution of an operation. The detail provided in the COPD must not be mistaken as generating a requirement for a complex and detailed plan; rather, it is designed to help the planners develop a product of clarity and simplicity capable of providing the necessary guidance to execute the commander’s vision. (1) Review NATO strategic and military strategic objectives and effects and assess the impact of military actions on the information environment. (2) Further develop narratives, themes and master messages for different audiences. (3) Determine StratCom aims and match to audiences and targets for StratCom effect. (4) Establish responsibilities and arrangements for military support to Public Diplomacy, PA, Info Ops and PSYOPS. (5) Develop criteria for the assessment of StratCom activities and the impact of military activities on the information environment. (6) Coordinate StratCom activities with non-military and non-NATO entities. (7) Ensure limitations are taken into account. (8) Assess risks to achievement of the StratCom strategy and develop mitigation actions. (9) Identify and establish required mechanisms to address issues of strategic and/or political importance, including but not limited to Civilian Casualties (CIVCAS) and counter-propaganda. b. Review NATO Strategic and Military Strategic objectives and desired effects. NATO strategic and military strategic objectives and desired effects are developed to ensure that NATO achieves its end state in an operation. NATO’s actions must be clearly understood to gain support from governments, populations and other groups in the theatre as well as to influence the actions of adversaries. StratCom must continually analyse the objective and desired effects in light of current strategic conditions to ensure that StratCom activities are coherent and integrated with military actions and contribute to desired effects for each phase of the operation. c. Further develop narratives, themes and master messages for different Target Audiences. Based on their understanding of the different perspectives and biases of the different audiences, StratCom should develop an over-arching, resonating narrative, upon which themes and master messages can be based. StratCom must then refine the themes and master messages depending on the strategic conditions, taking into account target audience receptiveness, susceptibility and vulnerability to different historical, social, cultural, and religious references. This may include the necessity to establish agreed terminology to be used by all actors in the information environment when referring to adversaries and local populations. Red and green teams as well as systems analysts and other experts from the KD team may be able to assist. d. Determine StratCom aims and match to audiences and targets in conjunction with an over-arching engagement strategy. The Alliance (and its Partners if applicable) must act in close concert in the delivery of agreed themes, messages and actions based on a planned and coordinated design to deliver specific StratCom aims. Where possible, other international actors, opinion formers and elites should be integrated into this approach through a coordinated engagement strategy at all levels within the wider local, regional and international public to promote support for NATO actions. e. Develop criteria for the assessment of StratCom activities and the impact of military activities on the information environment. To assess the effectiveness of activities and messages in achieving the StratCom aims and contributing to the desired effects, StratCom must develop operations assessment criteria and measures of effectiveness within the larger cadre of the overall operations assessment effort. These should be closely coordinated with SHAPE strategic effects, Info Ops, PA and planning for the conduct of operations assessment at the strategic level. f. Establish responsibilities and arrangements for military support to PD, PA, Info Ops and PSYOPS. On the basis of coordination with NATO IS and IMS, the supported JFC, and relevant cooperating non-NATO actors, StratCom, must clearly establish responsibilities and coordination mechanisms for the conduct of military activities in support of PD, PA, Info Ops and PSYOPS within the theatre. g. Coordinate StratCom activities with relevant non-military and non-NATO actors. To promote coherence in StratCom among the non-military and relevant cooperating non-NATO actors, StratCom should arrange a suitable venue in consultation with the NATO SCPB, to coordinate and harmonise the principal aspects of StratCom activities in the theatre and within the wider international community. In particular, arrangements and mechanisms must be agreed that will allow regular coordination of information activities during the subsequent phases of the operation and in response to urgent information requirements as a result of events on the ground. h. Ensure limitations are taken into account. There will likely be restraints and constraints imposed by political-level guidance and conditions in the JOA. These must be taken into account to ensure the StratCom effort remains focused and does not exceed the level of ambition of the nations. i. Assess risks to StratCom strategy achievement and develop mitigation actions. Risks to achievement of the StratCom strategy can take many forms, including but not limited to message incoherence, information fratricide and rising expectations. These risks must be evaluated and mitigation actions planned against them. j. Identify and establish required mechanisms to address issues of strategic and/or political importance. There is a need to identify and establish required mechanisms to address issues of strategic and/or political importance, including, but not limited to, civilian casualties (CIVCAS) and counter-propaganda. Mechanisms are required to address issues of political and/or strategic sensitivity to prevent an erosion or loss of NATO’s credibility and prevent the development of a gap between what NATO says and does and the perception of NATO at all levels. These mechanisms can take many forms, but two important issues are CIVCAS and propaganda. Responsive, thorough mechanisms for identifying, investigating and releasing information on all credible CIVCAS claims caused by NATO forces must be implemented and coordinated at all levels. Equally, implementation of a proactive counter propaganda mechanism coordinated at all levels is a must. Failure to do either of these mechanisms will result in a rapid loss of NATO’s credibility in the theatre and perhaps even within the wider international community.